During the nine years since the first 100 millionth Haier refrigerator was completed onÂ the production line, much has changed at Haier. Not only has the company been able to realize an expansion in production from "1" to "3", but also an upscale in production from traditional refrigerators to smart refrigerators, and now "ecological refrigerators". TheÂ completion andÂ saleÂ of the 300-millionth refrigerator, therefore, marks the beginning of a new era for the home appliance industry and marks Haier's transition from a traditional 1.0 manufacturer to a high-tech future-ready 3.0 "ecological brand"Â which focuses on users' lifestyles. In the era of traditional 1.0 manufacturing, the refrigerator was seen as utility used for storing food and produce. During this period, Haier researched and developed the first inverter based refrigerator in China. With the fast development of the Internet, the global refrigerator industry entered the era of 2.0 smart manufacturing. After creating a networked refrigerator, Haier introduced the refrigerator-kitchen concept, successfully launching the idea of a smart kitchen into China with the fridge at the kitchen's core. Since the second 200 millionth refrigerator was completed onÂ the production line, Haier has accelerated the development of the smart kitchen concept. With the rapid growth of new technologies, such as AI and 5G, the Internet of Things the physical world is becoming more integrated with the virtual world. As internet speeds become faster at high speed, building a new ecological system has become easier and will form the essence of the new 3.0 era. While the industry is exploring kitchen with linked products, Haier continues to center on the refrigerator as the core of the modern kitchen, connecting over 100 resource partners under seven categories to generate an ecology of linked foods for the 3.0 ecological era. The ecology of linked foods, supported by AI big data and other technologies, actively provides services to users on aspects of quick cooking, fresh storage ideas and smart health solutions. Through cooperation with partners, the ecology of linked foods realizes a fully-linked ecology, such as health resources, safe foods etc. 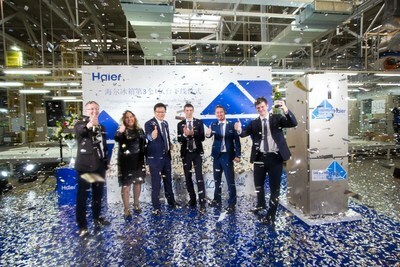 After the 300 millionth refrigerator was completed onÂ the production line, Haier plans on continuing its upgrading into the high-end technology and will popularize and launch its smart refrigerator-centred ecology of linked foods globally and will continue to focus on becoming a leading ecological brand.